I have been working hard to get control over (and response from) those hind legs. Wow, it’s been two months since I’ve posted. October wasn’t much to write home about. Derbs had another abscess – a dramatic one that caused one of his hind legs to blow up worryingly. It was slow to resolve, so between that and my travel schedule, riding was spotty though we did continue to make some progress. However, things have changed dramatically in the last two weeks and for the better due to one important change – hind shoes. It has been so very difficult for me to put Derby together and really get his hind end engaged. It’s been a constant struggle for years. I can get moments of connected work but God, it’s hard and it takes complete vigilance to maintain. Offhandedly one day, our farrier mentioned to Christy that he thought some of the horses would benefit from hind shoes, which would provide more support for their hocks. Given that we have a barnful of ex-racehorses, who put more stress on their hind ends breaking from the gate as two year olds than your average riding horse, it makes sense that supporting their hind ends would make them more comfortable. But honestly, this never occurred to me – Jag only ever wore shoes in front, and Mads was barefoot. But the difference that shoes in back have made for Derby and others is (in my mind at least) pretty amazing. I could feel the difference immediately, and in ways I didn’t expect. Right off the back, the walk was swingier. Half way around the arena, on our first lap, Derby strrrrrretched down and out to the end of the reins. He stayed there, stretching all the way through his top line, in the nicest free walk I’ve ever ridden. And it got better – I could put the trot together and keep it together. Last night and tonight, we broke through to a new level, staying smoothly connected, round and engaged for minutes at a time. Change of bend, leg yields – you name it, it’s easier now. I’ll get some updated video next week. After a few rides in which thing went really well (previously documented here), things have gone a bit south lately. I attributed much of my difficulties to a few intense Pilates sessions, which left my hip muscles and core tired and made rides on the same day as my sessions hard. Then I promptly got sick, and missed a few days in the saddle. Today I got back on and had an okay but still-not-as-good ride on Derbs. He’s moving forward nicely but I’ve been having the very devil of a time getting him connected. He’s been bracing and resistant, and my ability to influence his inside hind leg has been iffy. It’s not been terribly pretty. After I put Derby away, I pulled out my buddy Tucker. He’s my truth teller, and I was looking forward to seeing what my ride would reveal. Well, it was revealing all right, and not at all in the way I expected. We had a lovely ride. 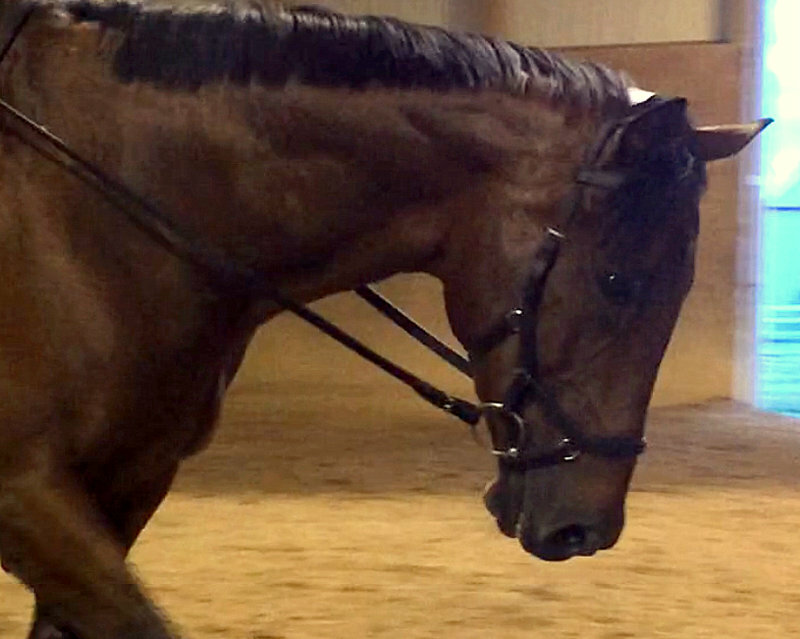 Tucker was steady in the bridle. We rode lovely connected serpentines, deep corners with nice bend and easy shoulder-fore. Will report back after tomorrow night’s lesson. 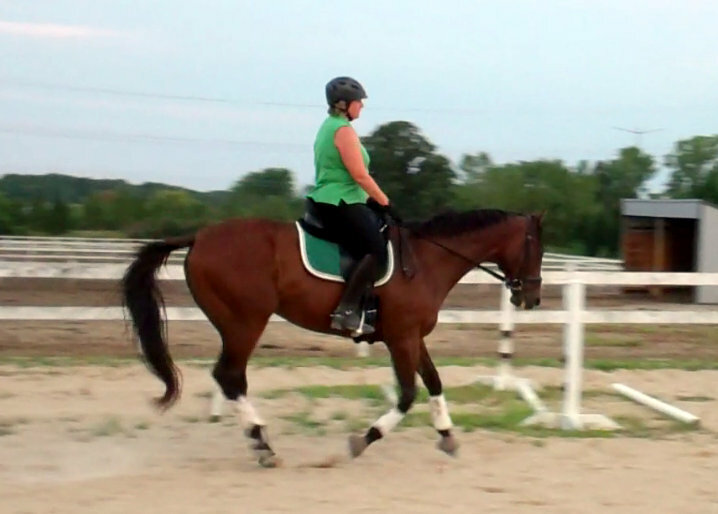 Still working on the canter. Thank God. After a brutal couple weeks, I’m off the road, back at home, and back in the saddle. We’re shooting for a couple shows at the end of this month and the beginning of next to wrap up the season, so it’s time to buckle down. 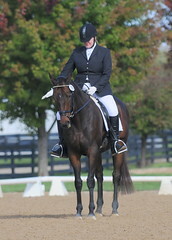 The last show is the IDCTA schooling show series championships. We’re qualified already, but I’d love to get one more show under our belts. 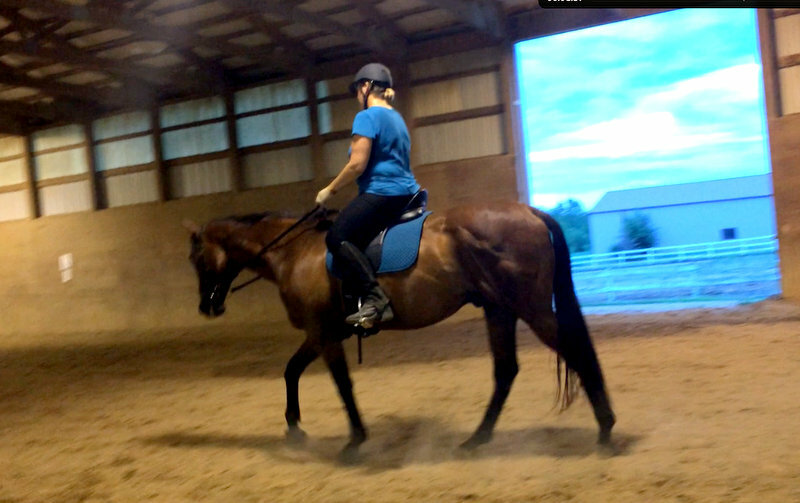 I’m pretty happy with how our rides have been lately, though as I discussed with Christy today, I really need to concentrate on making true forward gaits our default gear. I’m still falling into the habit of letting Derby lollygag and slow down, rather than staying in front of my leg. We’re going to focus on this issue in particular this coming week. I’ve also been working on improving our bend, and really getting Derby to step under himself and into the outside rein. This is a real weak area for me but I’m determined to nail this key basic. At the Robert Dover clinic last fall, a woman who was riding Fourth level on a gorgeous and talented horse wound up getting schooled for her lesson on bend. It underscored for me the importance of mastering the basics. So I’ve been doing a lot of spiral in/leg-yield out and other exercises assigned by Christy. We’ve also uncovered a few issues with my position that interfere with (or mute?) my aids. One thing I’ve caught myself doing – especially to the right – is curling my inside leg up, rather than encouraging the horse to bend around it. In addition to clarifying my aids, I also need to insist upon a crisp response from Derby. However, I’ve thought he had something else going on. He’s not entirely comfortable going to the right. 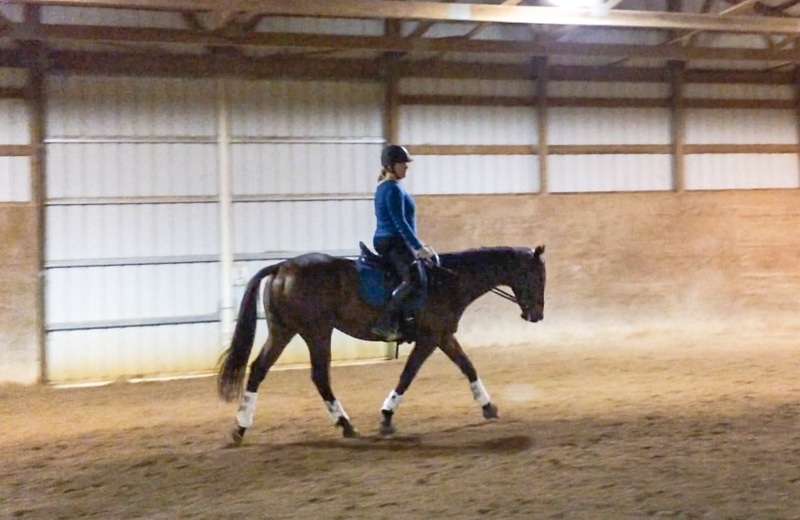 His canter to the right can get lateral, and he’s harder to bend to the right. So I scheduled a chiropractic appointment for Derby, and that appointment was yesterday. It was fascinating to watch. Dr. Heinze from Fox Valley Equine work on Derby and the other horses. He first evaluated each, and was able to identify areas (such as part of the spine, or a hip) where there was less motion. In Derby’s case, he had little flexibility in his right hip, and also had some stiff spots in his spine. We went ahead with the adjustment, and Dr. Heinze said I could expect to see improvement over the next few days. I do believe he bent more easily to the right, however, I wasn’t riding terribly effectively today. But when I finally got both of us warmed up and moving, Derby felt pretty good. Derby getting used to the Micklem. However, I complicated things a bit by adding a new variable – a Micklem bridle. I got a bit of a wild hair this morning and went up to the Dover store and picked one up. It took some futzing with to get adjusted, but I think Derby liked it. His mouth felt quieter and the contact was better. However, Christy experienced improvement in contact and a softer mouth after having one of her own horses adjusted. 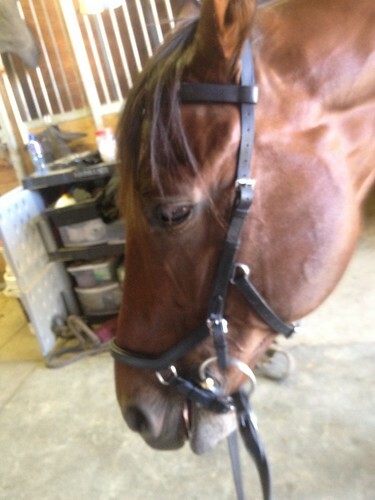 So whether or not it was the bridle or the adjustment, I don’t really know. I really should have just used my old bridle for the next few days, but I couldn’t resist giving my new toy a try. In other news, I’m having Derby re-scoped on Tuesday. He’s having more difficulty than usual with his breathing. Normally, he’s fine after taking a few laps to clear his pipes, during which time there’s lots of coughing and sneezing. Lately, however, the episodes of coughing and sneezing have been more frequent, recurring during our rides. Hopefully it’s just a little inflammation, and we can knock it back with some drugs. We’re riding again tomorrow (the weather is perfect!) and I’m hoping for a better ride that will give me a better read on how effective the chiro treatment was.